Thank you for your love and support. 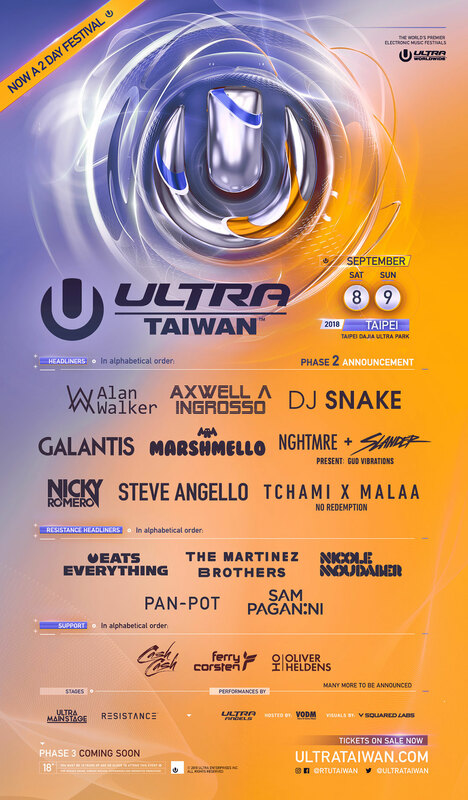 After 4 years of Road to Ultra, Taiwan’s first edition of Ultra Music Festival, voted the BEST music festival in the world, will take place in September, 8th and 9th 2018 at Dajia Ultra Park in Taipei Taiwan. Ultra Taiwan will premiere a main stage designed by the world renowned stage designer showcasing world-class stage production including cutting-edge visuals, lighting, cryogenic and pyrotechnics featuring the most popular DJs in the world with dazzling special effect and fireworks. One of the many unique stages, RESISTANCE, will captivate you with music from the world’s greatest DJs and producers and state-of-the-art audio and visual experience. The stage will be tented inside a large dome in order to elevate your every senses. Come joining us on September 8th and 9th and be apart of the moment that will define the electronic music history in Taiwan and experience the ULTRA experience. For those that purchased combo tickets (RTU Taiwan + RESISTANCE Taipei) earlier this year, your ticket will automatically be upgraded to a 2-Day Combo ticket (GA, Premium or VIP) for the festival. Those that purchased an RTU Taiwan or RESISTANCE Taipei ticket will have the opportunity to upgrade their ticket to a 2-Day Combo ticket (GA, Premium or VIP) for the discounted price of NT$ 999. For those that purchased an RTU Taiwan or RESISTANCE Taipei 1-Day ticket earlier this year and do not choose to upgrade, your ticket will be honored for the same day previously purchased. General Admission – Includes GA admission to Ultra Taiwan 2018. Premium Admission – Includes Premium admission to Ultra Taiwan 2018. VIP Admission – Includes VIP admission to Ultra Taiwan 2018. 1. In accordance with Civil Aviation Authority regulations, balloons, drones, fireworks, and laser pointers are strictly prohibited at this event. 2. Umbrellas or parasols (folding umbrellas are NOT allowed), flagpoles, selfie sticks, benches, chairs, stools, foldable chairs or any objects that can be potentially used as a weapon. 3. Knives, bats, sticks, and glass type items or any kind. 4. Illegal products such as illegal drugs and dangerous goods. 5. Any cigarettes or cigarette boxes, cigars, lighters, matches, electronic cigarettes/vapes, or vape liquids or oils. (Designated smoking area is available inside the venue) Anyone found smoking in non-smoking area, our security will perform a body search for the cigarettes and it will be confiscated and discarded. Confiscated items will not be returned to the owner. 7. Any type of containers. hydration bags or thermos bottles are NOT allowed. 9. Outside drinks and food NOT allowed. 10. Prescribed medication will be subjected to evaluation by on-site medical staff in order to bring into the venue. 11. In order ensure the safety of all attendees and staff members, only bags under A4 size (21 x 29cm) will be approved for entry. There will be manned coat check outside the venue. After checking in your bag, you will receive an clear bag to bring your necessities for faster entry. 12. Any type of folding chair, recliners or tents are not allowed, and will be discarded when found. 1. Small mats or cushions, picnic mats. inflatable sofa, folding chairs, hammock are forbidden at the non-grass area. Violation of this rule might result in a forceful removal of your property. Please keep all metal products to a minimum as they might disrupt the metal detectors. 1. Non-aerosol insect repellant and sunblock. 2. Hats and light jackets. 3. Small mats or cushions, picnic mats (if you wish to sit on the grass). Picnic mats not allowed in non-grass areas. 4. Banners/flags (please remember to be respectful to the national flag). 6. Small gimbal or image stabilization handles for Gopro or cellphone under 30cm (top to bottom) is allow. Any extendable(telescopic) or folding handles are NOT allowed! 2. National ID Card, Driver’s License, Health Insurance Card, or Passport. 3. Cash or credit card. 1. Please note that you are responsible for your ticket. The organizer will not be responsible for any lost or damaged tickets. Combo tickets must be used by the same person for both days, and could not be resold once used. 2. Tickets do not include drinks. Please do not bring any outside food or drinks. We will ask all attendee to finish or discard their food before entering the event premises. There will be food and drink vendors at the event. 4. The organizer reserves the right to change the venue and the artists. 5. Please be considerate of the environment. DO NOT LITTER! 6. If you feel any discomfort or notice anyone with health problems, please seek medical attention at our medical tents. 7. Attendees under the age of 18 will not be admitted into this event. Attendees without the proper identification will not be admitted (please remember to bring your identification documents for inspection, such as national ID card, driver’s license, health insurance card, or passport). 8. For the safety of all our staff and patrons, security personnel will check all backpacks including pockets before attendees enter the event premises (the organizer reserves the right to search all attendees). If you are carrying a unclear bag, we will require you to empty your bags into plastic bag for inspection. Anything found not in the plastic bag will be discarded. 9. Please drink rationally at the event and remember not to drink and drive. 10. In order to secure the safety of everyone at this event, there will be police officers patrolling the event premises at all times. 11. Any attendees exhibiting inappropriate behaviors (i.e. illegal activities or actions/behaviors that negatively affect other attendees) will be immediately removed from the premises without re-entrance. 12. Please do not purchase tickets from untrusted source. If you are caught selling fake tickets you will be handed over to the authorities. 13. Anyone who enters the venue inappropriately or holding a fake ticket be charged double the amount of the regular ticket price. 14. This event will take place whether rain or shine. In the event of a natural disaster, please refer to Spunite fan page for refund details and procedures. 15. To ensure the safety of attendees and traffic maintenance, please use public transportation and shuttle buses to get to the event venue. 16. Any attendees not wearing the proper event credentials will be forced to leave the venue or area by the security staff. 17. All refunds must be received by the organizer at least 10 days before the event date. 10% refund fee will be charge for refund of any type of tickets. Please email refund@spunite.com for more detail. Refund for returned tickets will be issued by November 10th 2018. 18. If you see any suspicious, dangerous and illegal activities or someone who health concerns, please notify the nearby staff members. 19. Any prohibited items reported or discovered by our staff will be confiscated and discarded. You will not get your items back! 20. Please follow https://www.facebook.com/RTUTaiwan for updates and announcements. All sales are final. Non-transferable, cannot be exchanged nor cancelled. Must strictly follow the security guidelines issued by organizer. including security policies, entry rules & venue regulations. Please be sure to read the above “Safety Regulations”, “Event Regulations”, and “Terms & Conditions” before proceeding to ticket purchases.